SKIMFLOW® ES is a premium fast drying, blended calcium aluminate and portland cement based self-leveling underlayment that may be used for leveling and smoothing of floors for tile, stone resilient wood, carpet and other floor coverings. SKIMFLOW ES seeks its own level providing excellent working time and delivers compressive strengths over 4200 psi and may be covered in less than 24 hours. SKIMFLOW ES may be used as a temporary wear surface during construction provided the installation was per manufacturers written instructions. SKIMFLOW ES offers an extended working time to reduce the chances of a cold joint forming. Self-drying: walkable in 2-4 hours and ready for floor coverings no later than 24 hours. Perfect for fast track applications. Hard surface capable of withstanding trade traffic before installation of floor coverings. Suitable for finished flooring such as vinyl, LVT, carpet, engineered wood, ceramic tile & others. For best performance and to maintain guarantee, an approved primer must be used on all surfaces. (Use of a not approved primer voids all warranties). All supporting surfaces shall be structurally sound, solid and stable. They shall be free of dust, oil, grease, paint, tar or other contaminants that may act as a bond breaker. Application over textured surfaces will give the best bond. Concrete that has been steel troweled should be scarified or bead blasted to give a suitable bonding surface. A CSP (concrete surface profile) of at least three (3) is recommended. Wood substrates must be clean, stable, and free of excessive deflection. After the floor is clean and primed, lath must be installed onto the surface. Furr the lath to a depth of half the desired thickens of the pour. For example; if you are pouring Skimflow ES 1” the lath should be furred ½” above the floor. Once the concrete surface profile of 3 is achieved, prime the floor using our PRIMER A.
squeegee may be used if necessary. Non-porous Substrates: On non-porous substrates dilution is unnecessary. Using a broom or a nap roller prime the floor with a neat coat of PRIMER A, ensuring you do not puddle or over-prime the floor. Testing the Primer Layer: One way to check if you have a good primer layer on the floor is to perform what is commonly called a tape test. Take a piece of duck tape and securely place it adhesive side down onto the floor. After ensuring it is bonded, aggressively rip off the tape onto the floor. On a properly primed surface, the primer will remain bonded onto the floor. Use a clean mixing container, pour in proper amount of clean, cool potable water, and add powder slowly. Water/powder ratio is 4.75-5 quarts of water to 50 pounds of powder. Start mixing, as bags are added, at slow speed (150-450 RPM) using a mixing paddle designed to avoid air entrapment. Once material is well wetted by liquid, mixing speed may be increased to 1000-1200 RPM max. Again avoiding air entrapment, mix 1.5-2 minutes to a homogenous lump-free mixture. Do not shake. 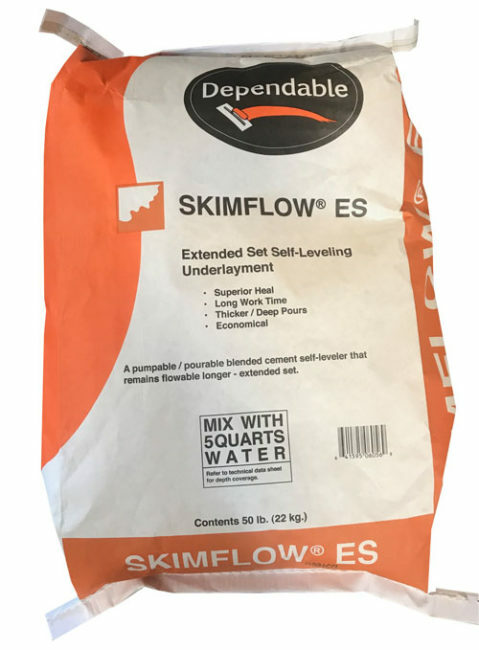 SKIMFLOW ES can be mixed in large quantity mortar mixers or special pumps or in smaller quantities (up to 3 bags at a time) in a 20 gallon container. If a problem is encountered with the mixing device getting a lump and powder free mix, try starting with 2/3 of proper water, adding powder until just wetted, then adding remainder of water and thoroughly mixing. A screen may also be used in large scale mixers. Pump or pour entire container of mix on oor after allowing air bubbles to rise to the top after a minute or two. Do not over-water, and do not re-temper or add water. Dependable SKIMFLOW ES underlayment is highly owable for 15-20 minutes at 70°F (21°C). It can be moved with a screed set to an appropriate depth. Once SKIMFLOW ES starts to set (about 45 minutes), stay off oor until set. The underlayment hardens in 1-2 hours and is ready for oor covering within 8-24 hours. Begin at a corner of room or at a deep part of ll. Plan the pour before starting. Either work back and forth along a line of the room or from the center of the ll outwards in all directions to keep pouring against the freshest material possible. Lightly work the transition points between pours and material over or under desired depth with a screed set to the desired depth or lightweight oat or straight-edge. Any imperfection can be smoothed by surface trowelling or drawing a straightedge over the surface. Direct sunlight, heat and wind can cause rapid drying of the product which may reduce working time. To avoid rapid drying, provide protection against these elements. Designed for interior use. Material can be pumped, ensure the pump and hose are cleaned prior to use, and the pump and hose should be cleaned immediately following the pour. • Where either the surface or air temperature falls below 50°F (10°C) or above 85°F (29°C) within 72 hours after installation. • When finished floor is subject to freeze (32°F or 0°C) any time within 7 days. • Where hydrostatic pressure is present or moisture emissions exceeds level permitted for an installed floor covering. 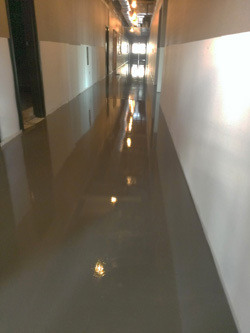 • Where hydrostatic pressure is present or moisture emissions exceeds level permitted for an installed floor covering. 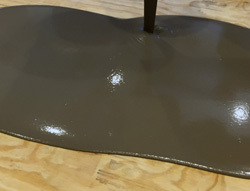 SKIMFLOW ES Underlayment can tolerate any amount of moisture from a concrete slab so long as all of the moisture from the slab will escape past the floor covering. If the floor covering’s moisture permeability does not meet or exceed the moisture content of the slab, Dependable recommends moisture remediation. Use Dependable’s Vaporseal HM, or an approved alternative, to remediate moisture in concrete, consult the Vaporseal HM data sheet, or call technical services, for more details. • Over particle board, presswood, masonite, chipboard, Luaun, or similar dimensionally unstable materials or any substrate not well bonded or free of movement.